Fish finders are typically installed on fishing boats and other watercraft. They consist of an electrical supply and digital display, which are located in the top of the boat, as well as transducer sensors which are mounted on the bottom of the hull. These transducers serve a dual purpose; they emit sound waves, directing them towards the floor of the body of water, and they receive the sound waves that bounce back. The transducers are connected to components called transmitters, which are located in the top of the boat with the power supply. The transmitters are in turn connected to electrical receivers, which are connected to the displays that fishermen use to interact with the fish finder system. Once turned on, fish finders do all the work, leaving fishermen to simply read the display and catch the fish. The process starts when a transmitter sends an electrical impulse to the transducer, instructing it to create a sound wave in the water. This sound wave travels downward, expanding as it moves farther away. When the sound wave hits an object, it sends the sound wave bouncing back up. The transducer recognizes this bounced-back signal and relays it to the transmitter. The transmitter puts the echo data in the form of an electrical signal and sends it to the receiver, which translates it into digital data that can be shown on the display. 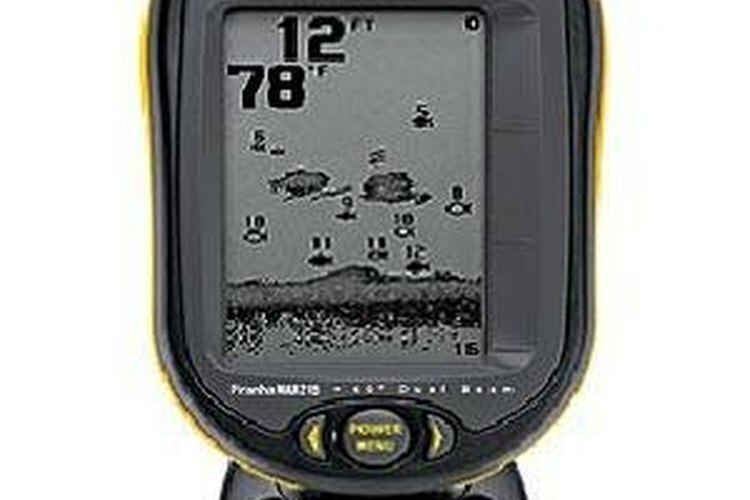 By looking at the display screen, a fisherman can tell what is under the watercraft in real time. There are dozens of different manufacturers that all produce multiple models of fish finders, so there are lots of different display configurations. Some of the higher priced fish finders have such sensitive transducers that their displays can tell you what is and is not a fish. These fish finders can actually detect the contours of fish, distinguish them from other underwater objects and report them to the fishermen in the boat by displaying little fish-shaped cursors on the screen. Less-sensitive fish finders usually have displays that look like sideways-scrolling line graphs. The uneven but mostly horizontal line represents the floor of the body of water, and fish or other objects are represented by spikes in the line or floating dots above the line. With these systems, fishermen must take other information into account to determine whether the objects detected by the fish finder are fish or something else.